This week I am still in San Francisco, here for the CSS Working Group meeting at TPAC. I am hoping we'll get a chance to discuss some of the outstanding multicol issues today, so I can keep the work on that spec moving forward. We closed some long-debated grid issues yesterday too. A lot of the discussions are about things that seem pretty much edge-cases, but it is in these things that differences in how browsers render CSS creep in. If a part of a spec isn't fully defined then people make different decisions as to how to deal with it - and that's when you find a "browser bug". No-one wants there to be rendering differences, but it turns out that working out what to do in a way that can be implemented in browsers, understood by web developers and won't break existing websites is hard! 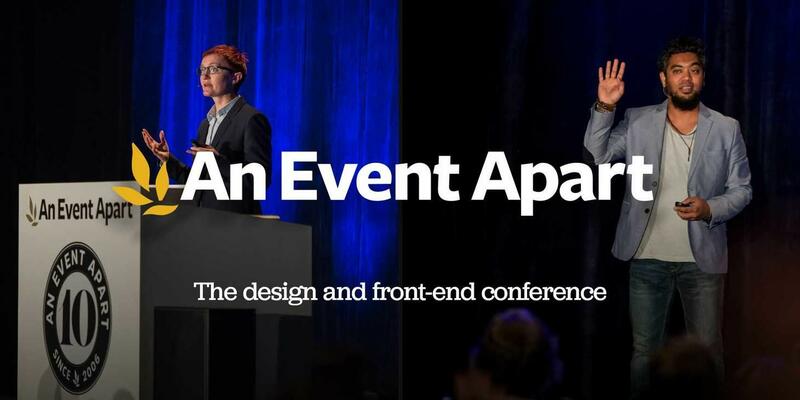 Thank you to An Event Apart for sponsoring CSS Layout News! See the footer of this email for a discount. I'll be speaking at every An Event Apart in 2018, and would love to see you there. I'm speaking at this event in London on Saturday. It's a free one day conference, and there are still tickets available. If you are in London on Saturday - come along. This is my penultimate event of the year, just this and An Event Apart Denver and I can go into winter conference hibernation. Another great recording from CSS Day. This is Jen Simmons talking about Writing Modes. Writing Modes are important if you want to really understand how layout works in CSS today so I can recommend you take a little bit of time and watch this. Following up from the work I did writing the guides for Grid Layout, I've started work on some for Flexbox. Here is the first one - although it will need revisiting once the others are complete as I'll link those up. Once done this should be a very in-depth reference for the spec. This is excellent. A thorough look at creating responsive and accessible tables. A really nice article, with lots of examples, showing how Grid and Flexbox aren't competing layout methods but instead can be used in combination to solve layout issues. Back in Issue 67 I linked to this design system created by Morgan Feeney, it has evolved and makes use of CSS Grid Layout so you may find it interesting. Something I am interested to see are people starting to think around the possibilities of new layout, creating systems that really make use of what we now have. Year after year, smart, focused, dedicated designers and front-end professionals tell us no other conference comes close to offering the insights and information they get from attending An Event Apart—three days of cutting-edge design, code, and content. Set yourself Apart. Learn the design, UX, front-end skills, techniques, and technologies you’ll need this year, next year, and the years ahead–at the web and digital design conference for forward-thinking professionals. Register now and save $100 with discount code AEACSSLAYOUT.